Last night I went to the launch of a friend's anthology of poetry called THE SONG OF THE BUTCHER BIRD. 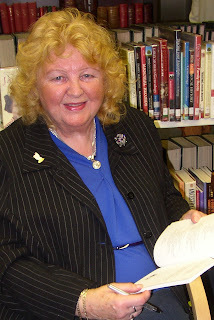 Gladys Mary Coles is a poet, biographer, novelist and teacher and is the person most responsible for my becoming a published writer. For over ten years I went, most Wednesday evenings, to her two hourly sessions in a local school, and her encouragement over that time was invaluable. THE SONG OF THE BUTCHER BIRD is her tenth volume of poetry and leafing through the one that catches me is one called Ithaca-Liverpool and is about her father walking along the beach remembering war. The entire anthology is about war in one form or another - past and present. Since Gladys Mary is also an historian there some interesting footnotes - and in one section an excerpt from her recently-completed novel which features the blossoming of a young poet during the first world war. She read some of this out during her launch and I am very much looking forward to reading the rest. I'm still reading THE INVISIBLE ENEMY and learning a lot about LassaFever, Ebola and now rabies...and detail about that mysterious disease Anne S talked about (which killed the Brisbane trainer). If a disease kills quickly it has to be spread quickly - and there's something called a vector ( a transmitting agent e.g. a mosquito) which is also important. If I had more time I would say more (for Sundaysalon) but there's someone waiting for this machine. Anyway, 'tis all very fascinating - as is Oslo. It is quite unlike any other city I've ever seen - singularly unthreatening. I feel quite safe despite the odd drunk and was really surprised when a police car when past with its sirens singing. This morning I saw the Boxhouse which is the purpose of my mission and was most impressed and have written 400 words already - thought whether or not they are 400 suitable words remains to be seen. Back home tomorrow. In a way I shall be sad to leave. Ha, got through. I am now sitting in a big tent in what appears to be a BOOKFAIR in Oslo. Crime is big - there are sections devoted to it as there is in Amsterdam (where I passed through today). Anyway, was just passing through when I spotted a couple of computers with no one in front of them and I felt strangely drawn. It is cold here, as expected, but the locals are sitting outside the restaurants in coats (I think this is so they can smoke). As usual I have found that my hotel is located at the outskirts of the red light district and was just passing a local bar in time to see a local woman being escorted outside by two waiters. One long wide paved street (called a "gate" as they are in Chester) leads to a beautiful building lit up in white lights. I don't think I want to get there. I want it to stay at the end of my imagination. Some things are best kept like that. Following on from last weekend's successful Readathon, Debra Hamel and I thought that it would be a good idea to repeat the experience every Sunday for a couple of hours; so Debra has devised a special virtual room called the SundaySalon. The full details are here. You are welcome to join us. Tomorrow I am going here to talk to the man who designed this. I am looking forward to this tremendously. It has been a busy week (well for me, anyway). After seeing the Turner exhibition on Tuesday I went to another Chester Literature Festival talk. This was by Roger Lovegrove on the research for his book called SILENT FIELDS which was about the decline of the British wildlife. It was a very interesting talk and the author obviously has a great enthusiasm for his subject. In the last 400-500 years the diversity of British wildlife has declined. Where there used to be wolves, boar, beavers and lynx and a huge number of different sorts of birds there are much fewer different species. The decline has happened in three phases. The first phase was due to legislation passed during the reigns of Henry VIIII and Elizabeth I (1532 and 1566 respectively). 'Acts for the Preservation of Grain' encouraged every parish to raise a levy to produce a kitty run by the church wardens to pay people to kill 'vermin' that were eating the crop. Nets were laid to trap rooks, and small mammals such as weasels were presumably trapped near their dens. 2d (two old pennies) was paid for the head of a weasel, and 1d for most of the birds. It must have been a lucrative business for some and a grisly occupation for the church warden. This legislation, which was only repealed in 1863, ensured that pole cats were wiped out and species such as red kites, bull finches and ravens showed a sharp decline. Even hedgehogs were unsafe; it was thought that they suckled of recumbent cows at night, stealing their milk. As Roger pointed out, this is unlikely given the relative sizes of teat and mouth. However this cull was relatively unsuccessful overall since different parishes followed the royal edits with varying enthusiasm and the times of the killing were haphazard and not targeting the breeding season which would have been far more effective. The second phase in this story of the destruction of British wildlife was much more lethal. In the mid-eighteenth century the character of British countryside changed from the medieval system of rotation farming in open fields to the enclosure of farmland by the wealthy landowners after a a series of 'Enclosure Acts'. The landowners hired gamekeepers, with guns, to look after their land and get rid of vermin and until the first world war they were extremely effective and exterminated several species including pine martins, ospreys and wild cats. It is strange to think of anything good coming out of the horror of the two world wars but apparently they proved to be the salvation of British wildlife. The end of the second world war also heralded a change in attitudes with nature and wild-life starting to become appreciated and this was Roger Lovegrove's third phase. The RSPB, the conservancy council and the various wildlife trusts were established and legislation, this time to protect wildlife, was passed by parliament. Although it is still legal to kill rats, stoats and gulls, much of the rest of British wildlfe is protected. However the illegal killing of some species of rare birds of prey in places like the Peak District continues. There are more details about this history in SILENT FIELDS - a fascinating present for all those interested in British Wildlife. A great brown bear is trapped in a large open plan office in Berlin. He walks soulfully, his head hung. He stops. He hides behind a partition and then he walks again sometimes on two legs sometimes on all fours. He is human and bear. Animal and man. 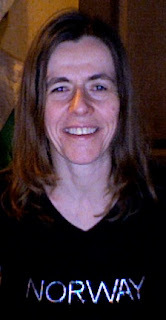 A too-large head on a fragile-looking body. Sometimes he looks puzzled, mostly he seems locked away. The camera pans out to the dark street and the people looking in. This is part of the art. We look but we do not interfere. there is the bear representing duality, perhaps, or hopelessness or duplicity and we look on. Is this what it means? Am I supposed to see the bear or the man in a bear's skin? Is he intending that I think of fairy tales and school and the scent of warmed souring milk? Because that is what I see and that is what I remember. The bear in a glass cage. The worry of Goldilocks being found out. The bear that looks as if it is safe to hold and yet I know is one of nature's most ferocious beasts. He likes honey but he also likes to kill. He can bat you with one of his affectionate paws and knock you cold. Then he will amble as he does now. The beast in our midst. Captured so we can see him. Believe and yet know he is not real. Victors over something that cannot really be conquered. We start here at the threshold. A doorstep of a door that isn't there. A plank of wood then, that we have to step over to gain entrance to the rest. This is the curator's work for the day; a living warning device so that no one trips over. Eventually two men come bearing a ramp because these days access must be universal. So a wheelchair may driven over installation 1 in order to see installation 2 (a doll's house without furniture or opening sides), and then installation 3 (the words 'There will be no miracles here' picked out in white light bulbs on a frame of scaffolding). For some time the Hodmandods stand before this trying to see the point. 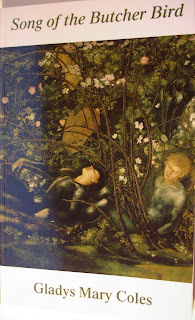 I read later it was originally set in a place called Modseine in Haute Savoie - which was renowned for its miracles. So I realise now that the context is important, and when a piece like this is set in a white cube of a room it tends to lose its impact. Space is important in art. One room leads to another. In one a bonfire: charred sticks tumble over each other with plastic red flames attached. For a few more moments we stand and look. You can see where the staples have been used to attach the flames. They remind me of little demons in their own little hell. We walk on. Another room has four large white cubes with small peep holes the size of a fist hacked out of the side. Then, peering inside we see a wondrous thing: the surface of a small sandy planet lit by white landing lights. Small dunes, reflected by mirrors, appear to go on and on to an alien horizon. I imagine flying over and seeing it all for the first time: an empty place oddly lit for unknown visitors. What lived here once? Do they live here now? In another box there is another similarly sandy planet. The dunes are different of course but we pause by each one to look and look. It is strangely fascinating. Then: another exit or entrance. We stop. Surely we have not yet come round 360 degrees and yet everything is the same. The confusion is deliberate. There is no beginning or end. Just like the mirrors and the sand dunes and the lights - they go on for ever. You can tell from the lights and the dust that this place is hot. There is a stillness too - the sort that comes after frenetic activity. Long after. So long in fact it is difficult to remember exactly what had taken place - just a dim feeling it was ferocious and dreadful. Yes, truly it filled us with dread, but now it is gone, and all is left is this: an emptiness and those guns leaning against the wall - just in case. And the fact that these are the only things around here that are polished and kept clean is chilling. Those are Bhimji's photographs. We walk past them into the dark room where the film is being shown again and again in a seven minute loop. Quickly we become immersed. The sounds around us are distorted and yet still familiar as if we are under water or in a womb. The camera pans around and once more we are in an alien place; in front of us are great hoppers of yellow fibre in a barn and as we watch something is happening to them. They are being sorted by a man with a long hoe. The camera hovers for a few moments, allows us to take it in, and then moves away. Up by the beams in the roof a fibre hangs; some draught allows it to sway hypnotically. Then, by the vents there are more fibres, like long weeds in a river; with the same sensation of motion, the same feeling of being swept away. But there is something else too; something that comes from the photographs, the same sensation that something dreadful has passed, and now life goes on. Rain thunders briefly on the roof and then people walk by. their distorted talk is easy, light. Nothing happens and yet we are fascinated by the strangeness of it all - the colours and the light, the man working apparently oblivious to our presence, the people talking as they pass and the strange being made stranger. I felt like I was being immersed in art; as if there was a metaphor was just beyond my reach and if I just stayed here long enough I would understand and not just this sorting room, but all that it represented, would become clear to me. 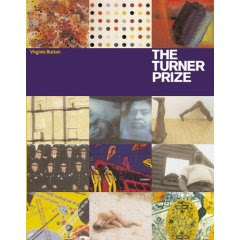 On the way out I bought the updated version of this very interesting book which lists and describes all the shortlisted artists since 1984. Tonight I went to see authors Adele Geras and her daughter Sophie Hannah at the Chester Literature Festival. I first had the pleasure of meeting Adele Geras fifteen years ago at Tÿ Newydd - Lloyd George's old house on the Llyn peninsular - on a writing for children's course. The book I wrote a little of there (having started it a few weeks before) was the first book I ever had published. 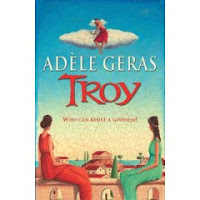 Adele Geras has written many, many books for children including TROY which was shortlisted for the Carnegie and Whitbread awards. She eventually entered the world of fiction for adults the same year as I did - 2003 (but her books I am sure have sold many more). 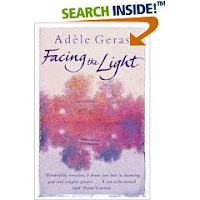 I heard her read an excerpt of FACING THE LIGHT at the Knutsford Literature Festival in 2002 and found it very engaging. I bought her second book tonight. It is called HESTER'S STORY. She read from her latest book A HIDDEN LIFE which started with a deliciously cantankerous woman leaving a will that would displease everyone. 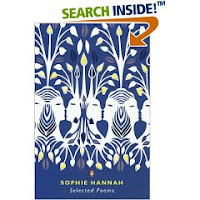 Sophie Hannah started off as a poet. 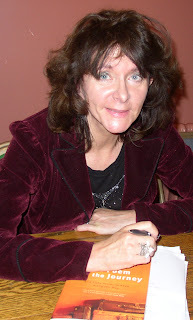 Her poems are funny and rhyme, and written, she says, about her relationships with ex-boyfriends. She read a few out and I liked them very much; as she says they are in the easy-to-understand, non-obscure mode. Her mother's poetry is more in the usual modern style and she has won an Arts Council of England Writer's award to write some more. 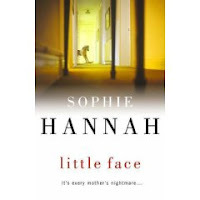 Sophie Hannah has now found much success with her psychological thrillers which are word-of-mouth best sellers. The first was LITTLE FACE and the second, HURTING DISTANCE, I bought tonight. I found it interesting to hear about the genesis of Sophie Hannah's two novels. In the first she thought of the start and worked out the end; whereas in the second she started from the ending. They both sounded really intriguing. 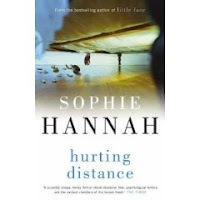 Sophie Hannah says she is a plot-driven author; and although the police are the same throughout all her novels each one is told from a different character's (someon directly involved in the crime) first person's viewpoint. 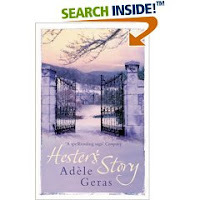 Adele Geras's work, in contrast, seems to be more character-driven - gentler and warmer novels about relationships and families. Plot, she says, she finds most difficult - so the two seem to enjoy a symbiotic and mutually supportive writerly relationship. 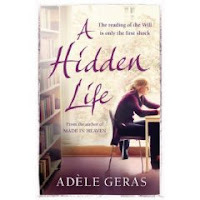 Adele Geras has another daughter - who is not a writer (this daughter is emphatic about this, apparently), but is in publishing (non-fiction), and Adele's husband, Norman Geras, is a professor at the University of Manchester (but more importantly is the writer of the successful Normblog). It was an enjoyable and entertaining evening with a good balance of reading and explanation. As we went home my friend Elizabeth and I tried to imagine breakfasts in the Geras household (when they are all together) and came to the conclusion that they were probably quite different from the monosyllabic grunts and sarcasm-laden silences that punctuate the usual Hodmandod repast (snails are not generally good in the morning). I was just showing my husband a short-cut which involved going through my ex-literary agent's offices when they turned into a hairdressing salon. We sat down and my husband, who by this time had turned into my brother, was told to get up because it was his turn to get his hair cut. However instead of going to a basin, as I had expected, he stepped fully clothed into a shower cubicle. 'Don't worry, I'll take care of him,' my ex-literary agent, Natasha, said. She came back to me as one of her assistants. 'I'm afraid...I really don't know how to say this, I think it'll be best if I whisper it...' she said to Natasha who was once again by my side. She was just about to tell me when I woke up. 'I was having such a strange dream.' I said to Hodmandod Senior. Which just goes to show how inaccurate these dreams can be. I have never picked up an axe in my life. Have spent the last hour posting comments and completing mini-challenges. Tired now, going off for a little nap. Back soon. Take the book you’re reading. Open it randomly and write 4 (or so) lines based on the first words you see. Don’t think too hard about it. Don’t want to ruin the relativity, I-Ching-iness of it. Rhyme not necessary. Just be spontaneous! 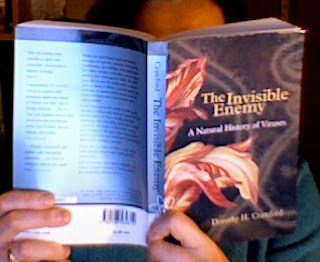 THE INVISIBLE ENEMY is a fascinating book - clearly written and packed full of amazing little factoids: how viruses are different from bacteria (and newspapers show a wanton disregard for the classification); how they are spread through skin and blood contact, or travel through the air on aerosols produced and propelled by sneezes and coughs; and how dreadful infections such as yellow fever and dengue fever are spread from monkeys to humans via mosquitoes - and as the earth warms so the mosquitoes will find new and vulnerable hosts (as has already happened with the recent case of blue tongue disease in famr animals in the UK). It is chilling stuff. Not terribly appropriate bedtime reading so maybe it is a good thing I am staying up! Hey 24 hour Read-a-thon readers! It's time for a fun mini-challenge. Take a break from reading and post a little bit about what you are reading. Some of you might know that I'm a librarian. One of the things I'm interested in professionally is reader's advisory. So, post a little bit about what you are reading and who you think might enjoy the book. Tell us what book is similar to what you are reading or which other author is similar to the author of your book. I'm really excited to read your entries so be sure to post a comment so I'll know where to look. I'm reading WE NEED TO TALK ABOUT KEVIN by Lionel Shriver and I would say it is a book that would appeal especially to any woman who has had a child. It describes with a raw sort of honesty those hidden thoughts I think most of us are slightly ashamed of having and so rarely express. The narrator is selfish, worried about what having a child will do to her and because of that perhaps as guilty as her son who is a mass murderer. It is not a spoiler to reveal this because this is described at the beginning and yet you still feel compelled to read on. I think perhaps it is a little like ALIAS GRACE by Margaret Atwood or BOY A by Jonathan Trigell because both of these books look at life from the criminal's point of view. The writing is similar to Atwood's also and perhaps some of Carol Shield's later works, especially UNLESS. Still going, still enjoying it, but there are so many interruptions...just now my mother on the phone needing some conversation. Recording time and words like this makes me realise just how slowly I read and how often the rest of life intrudes. An hour of reading is chipped away to about twenty minutes. Still on KEVIN (only p 55 but interrupted by preparing and eating dinner). WE NEED TO TALK ABOUT KEVIN is just as good as everyone I know has said it is. I've only managed to read 30 pages in an hour but there have been interruptions. I love her use of language and the way the metaphors slide slyly in. I suppose I'm enjoying it mostly because I identify with the narrator; with her concerns and why she does what she does and why she wants a child. They are unorthodox reasons, I suppose, but there is a familiarity there and I am sure at some point I thought of them too. Gradually she lets little pieces of information sli[p and I am intrigued and want to know more. Just finished GENTS (very short book). 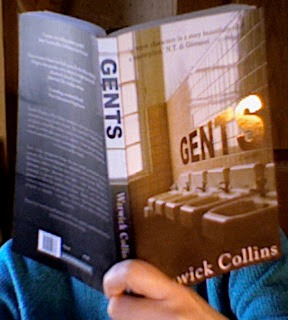 I enjoyed it and would like to know more about the author, Warwick Collins - maybe I shall investigate later. It is a light enjoyable read and I think its best quality is that it made me see the world from a different view-point. 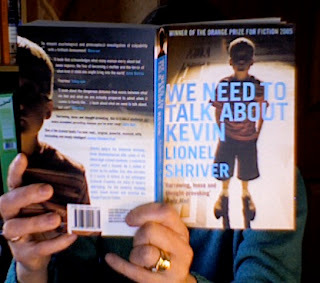 Now starting WE NEED TO TALK ABOUT KEVIN by Lionel Shriver which has been on my TBR list for ages. Athena at quatique is reading is reading one of Jasper fforde's books about a character called Thursday Next which is set in Swindon in which she reports that the town is not very popular - which is true. Somehow certain places in the UK acquire a comedic (boring) quality and Swindon seems to be one of them. I once was invited to the Swindon Literature Festival and had a very good time but can't remember the town very much at all...perhaps they are right about Swindon after all. They are very proud of being the setting of Mr fforde's novels though, I think. Becky is also writing about settings on her blog - but it doesn't seem to be in the context of the readathon. Perhaps I have the wrong blog. 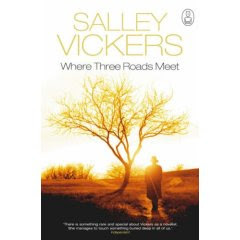 However Becky's challenge itself is interesting - finding a book set in one's home town - but I can't think of one set in my home town of Chester. First mini-challenge! This one is mine. If you would like to participate, go to Wikipedia and look up the place where your book is set. Post five interesting facts about that place in your blog. Leave a comment letting me know. I will draw one name from among those who participate, at noon my time, which is in four hours. If that person uses bookmooch, he or she gets one of my points. If that person does not use bookmooch, he or she gets to pick a bookmooch charity to have me donate the point. 1. they are eligible for the Loo of the Year award based on criteria such as signage, decor and maintenance and cleanliness. 2. The word toilet can mean either the facility or the appliance in English. 3. The British term for toilet ie loo may come from Waterloo and is first used in James Joyce's Ulysses. 4. The charge levied to use a UK public toilet in the mid-twentieth century was one old British penny - hence the expression 'spend a penny'. 5. In the UK the toilets are partitioned into cubicles. In the US these are called stalls. Just about 30 pages of GENTS to go now. It's a very interesting book about three Jamaican men who work as cleaners in a Gents' public toilet. What I like about it most so far is the unusual setting and the unusual point of view. It's entertaining (but not laugh-out-loud funny) and yet deals quite subtly with predjudice. The dialogue is excellent - lively and full of verve. I am just gathering resources for the Read-a-thon which starts tomorrow at 2pm GMT. People who sign up to be readers are committing to reading books, posting updates in their blogs, and if they need breaks, visiting the blogs of other readers and encouraging them. Suggested format for updating: Again, customize this as you wish, but I suggest updating about what you’re reading, how many pages you’ve read since your last update, and how much time you’ve spent reading since your last update. You may want to keep a running total of time spent reading, number of books read and pages read; this could make you eligible for some prize drawings. Updates might also be your typical book reviews, once you finish something. Readers visiting other readers: Do this if and when you’re in the mood, as often as you like. Chester Writers Performance Evening tonight. 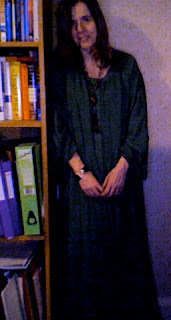 We were all absolutely wonderful (of course) and I wore my pea-green kaftan which made me feel bohemian although I kept tripping up (which spoilt the effect somewhat) because the kaftan is quite long and I am quite short (five feet two and three-quarter inches). 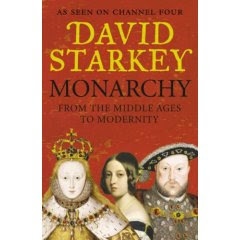 David Starkey's lecture on the Monarchy during the Chester Literature Festival was fascinating - he is an accomplished extemporaneous speaker, as was one of his subjects: Bertie, son of Queen Victoria. He described how patterns of monarchy repeated themselves (e.g. eldest sons detesting fathers) and also how the monarchy was forced to change in character because of the rise of the middle classes and universal emancipation. After Victoria the monarchy were forced to participate in public shows of ceremony in order to please the masses. For instance the crown jewels were worn (which gave George V headaches, migraines and then flashes of light (since he was forcing something circular on his non-circular head)) and the royal marriages changed from being arranged and celebrated in private to public romances with the vows taken most publicly in Westminster Abbey. ...rather like the superintendents of the nineteenth century mental asylums in fact (but that's just my take). 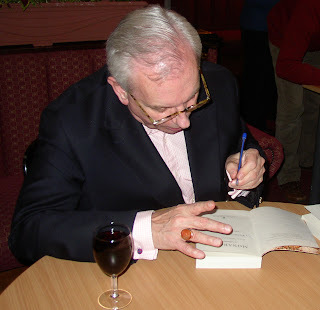 Apart from giving his much- appreciated lecture he stayed behind to sign a great pile of his new book Monarchy. When I asked him if it would be all right if I took his photograph he was charmingly obliging; an endearing man. A morning in the laboratory. It is so good to meet someone who is enthusiastic about what they do and yesterday I met a couple of virologists at a nearby hospital who really love their subject - and I could see why; it is fascinating. A group of nurses were being shown around and I went along too. Their job is to extract blood from drug-users to test them for diseases including hepatisis A, B and C, AIDS and syphilis. The laboratories we saw were highly automated. Great banks of machines are fed by workers dressed in the pale blue lab coats of the bioscientist. Trays are filled with tiny sample bottles and then the lids closed and the whole thing is left to go. There is a quiet hum and robotic arms shift, lift and sample. Everything seems relaxed and organised. I saw only about ten laboratory workers and yet they handle thousands of samples each week. It is one of the largest virology labs in the world. Each incoming sample is is labelled and logged on the computer so its progress can be followed. It is then fed into a sampling machine and robotic arms inject tiny beads which are impregnated with suitable antibodies. Any virus in the samples then reacts and sticks to the bead. The beads are then held by a magnet and washed and then tagged with another antibody which fluoresces in ultra-violet light. The greater the amount of light the greater the concentration of virus in the sample. Another technique we saw used the polymerise chain reaction (PCR) in which the DNA or RNA from a particular virus is amplified using a repetitive cyclic reaction. The cells in the sample are first 'opened' so that the RNA and DNA of the virus is exposed. This sample is then added to a fluorescent enzyme which will only bind to a full length of the RNA of, say, hepatitis C. This allows selective replication of the RNA. The solution is then heated to 95 degrees C which causes the strands to separate so that with more enzyme the replication process can then occur again. In the first cycle the quantity doubles, in the next it doubles again until, by cycle 20 there may be enough fluorescent RNA to be seen in the light detector. Maybe I am strange but I found this really exciting. It means that if you have a sample you are desperate to analyse you can stand over the machine and see exactly how much virus there is in a sample just by watching when the light is emitted. Then we saw the cold rooms and autoclaves, the category III laboratory where dangerous diseases are handled in low pressure rooms (so if there is a leak air goes in rather than out) and there are gloves boxes and air trap entrances. 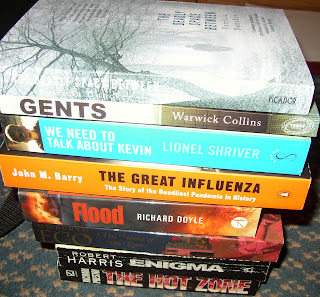 I came away determined to find out more...and of course have ordered a few more books for my research. I feel a new obsession coming on. I have to report that Crime Fiction Reader has managed to tempt me into the world of crime...and I am very grateful. At last, after a miserable haitus of about three months, I have started to write again - over 2 500 words today on a crime-based short story for this Honno competition. This is not something I've ever tried before and I'm enjoying it. Not very literary perhaps, but maybe that's a good thing - 'write something people want to read' one of my editors told me recently - and at least I'm writing something, which makes me happy. Thanks CFR! The Promise by Tracy Chapman. This is set to clips from Harry Potter and even though I have not followed Harry Potter at all and have no idea what it's all about I do rather like this compilation of scenes. (I'm on a bit of a Tracy Chapman spree - just ordered two of her albums LET IT RAIN and NEW BEGINNING from Amazon since they do not seem to be available for download from iTunes). (A pre-publication copy from her publishers, Canongate. It is about Freud's latter years. According to the start of this book he suffered from mouth cancer and was in such great pain that in the end was put out of his misery by his friend and doctor ). The writing, so far, is clear, interesting and utterly absorbing. Since this is from the author of MISS GARNET'S ANGEL I am not surprised. The apparently smooth surface of a quartz crystal; how close up it must be uneven with caves and hollows. Then I think of gas molecules hiding there. How sticking there may cause their electron clouds to shift and they sit there poised, ready to react. I used to study the surfaces of quartz. I used to use changes in concentration and temperature to find out how water stuck to its surface. Nowadays there are more sophisticated methods and the German chemist Gerhard Ertl has won a Nobel Prize all to himself for his work (see The Sceptical Chymist via Petrona for more details). By finding out how solid surfaces interact with gases we can discover all sorts of things about catalysts, or in my case, sensors. My plan for my next novel. (I'm looking forward to next week: on Monday I meet a consultant virologist who is going to discuss with me his working life, and on Wednesday I am going to Manchester again to meet potential supervisors for my PhD in creative writing). The Talk at the Women's Institute. Last night I gave a talk on my book 98 Reasons For Being at a Women's Institute about 40 miles away. I'd never driven to this place before and the lanes were dark and seemed to go on for much too long. However the map I'd been given turned out to be useful and I got there with five minutes to spare. It was in a bowling club and as there was a snooker tournament being held in their usual room this meant they had had to relocate to the downstairs bar so I gave my talk against a background of till bells and people giving orders - but they were fairly quiet so it wasn't too bad. I am better at keeping calm now. I help with the screen, untangle cables, plug them in and hope for the best. When it doesn't work straightaway I fiddle around with connections, turn things off and on (I have no system, I'm afraid) and generally persevere until I get a picture. It usually works in the end. After all, I tell myself when I feel myself starting to become anxious - what does it matter? If the projector doesn't work, I could just give the talk without it. It wouldn't be anywhere near as good but it would be all right. Nothing very bad would happen. So then, after 'the business' part of the meeting (they were an informal group - no singing of Jerusalem here) I gave my talk. They were a very attentive audience and gratifyingly asked lots of questions - a few of them even bought my book. Then, after about two hours I packed up and went home again, arriving back at 11pm. It had been an exhausting day but even so I found I was content and fairly happy. And this happiness is staying with me. In fact I'm actively trying to keep it with me. I think of it like a film of air I have taken with me as I dive again into the next day. Just recently I've felt as if I'm in a dark watery place and I'm struggling to escape. But if I keep this silvery air with me everything will turn out well. Happiness, I know, enhances creativity. Without it there can be no fire and there has to be fire for something new to happen. Tonight Hodmandod Senior and I went to a talk called Affluenza by Oliver James. He introduced his talk with this song (Mad World sung by Gary Jules). It is one of my favourites and always makes me think. The gist of the talk was that the values of modern society - particularly the English-speaking western societies - are driving us mad and I agree with him. Materialism, attaching too much value to celebrity and social and physical appearance, causes us to suffer from depression and anxiety. Selfish capitalism, as propounded with such vigour by Margaret Thatcher and her successors has caused our society to become ill. This, I believe, can be applied to the book industry too; the abolition of the net book agreement must have originally been inspired by greed. The result is that books are valued mainly as commodities and are sold like groceries; they are piled up like tomatoes and decorated with neon stickers advertising price not content. Books such as those 'written' by celebrities proliferate and are valued just because they sell in great number. It is a bad time to be a writer; I have been told that again and again. Especially bad for writers like me who write for the love of the feeling that the words give us when we read them on the page. We write to convey a thought, an emotion or what we think is an important truth. It is an aspiration which is at odds with materialism and it is bound to make us ill. So I intend to retreat for a while. British Children's television, which is amongst 'the most creative and innovative in the world' is now experiencing a crisis in funding which threatens the range and quality of public service programming. Save Kids' TV is a coalition of parents, producers, artists and educators who are campaigning 'to persuade the Government to acknowledge the value of children's television, and protect it in the face of growing financial pressures'. Their patron is Philip Pullman. Authors North Meeting: Subhub, Geoffrey Moorhouse and George Orwell. I have been elected to the committee of the Society of Authors northern branch. The main job of the committee is to arrange events so that should be interesting and I'm looking forward to being involved. I enjoyed the meeting very much. In the morning we had a talk about 'Publishing For Profit' or how to make money from websites. The speaker, Miles Galliford from Subhub, was so inspiring and made me think of so many enticing possibilities that for a few moments found myself filled with a sort of capitalist euphoria. 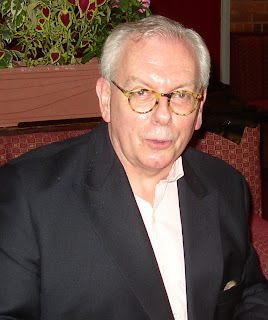 The afternoon event was a talk by the highly regarded and prolific writer Geoffrey Moorhouse. 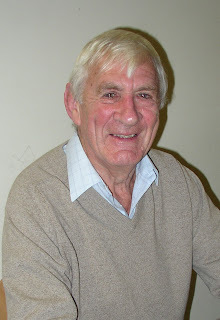 He has written more than 20 books - ranging from travel books to novels. His most recent work THE LAST ORDER is on the dissolution of the monasteries with particular emphasis on what happened to the monks in Durham cathedral and he treated us to a reading of the final chapter. This was rather good and sounded so fascinating I am looking forward very much to reading the whole thing when it comes out in March 2008. I have just printed out the whole essay because I am a big fan of George Orwell and think I have read all of his fiction. It was a long day but a worthwhile one. I arrived early at the station and so had two hours to watch the citizens of Leeds pass by: United fans yelled and sang drunkenly and aggressively across platforms; and girls, out for the night in scraps of skirts and sequins, giggled as they lurched by on high heels, expanses of flesh goose-pimpling in the cool air. Then, picking their way through all this, like a rogue dark thread in a garish tapestry, was a silent Muslim couple. The girl, in full veil, appeared to be very young because she was led by the hand like a child by her equally timid timid husband. And it is this scene that stays with me - this encounter between two such different worlds exciting neither comment or even, it seemed to me, much awareness of the other. I am off to a Society of Authors North meeting in Leeds tomorrow - my train is at 6.50am. This is so horrendously early I think it may be easier not to bother going to bed at all. 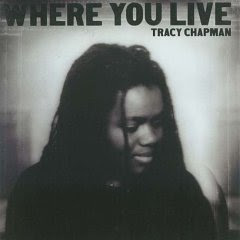 Where You Live - Tracy Chapman's 2005 album. (Her voice has lost some of its reed-like quality of youth but has become more sonorous and deeper). Writing a big monster-plan for my next book. Just a quick post tonight since I have just come back from a talk by Ruth Padel and am off to London tomorrow and still not packed. 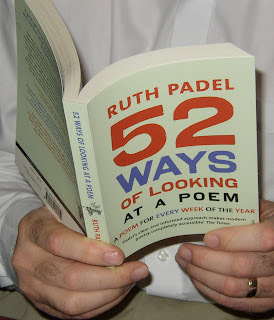 Ruth Padel's talk was about poetry in general. I am not a poet though I sometimes write the odd piece which I think might be a poem. The poems I like the best are those that rhyme in a very subtle way so they have their own indefinable music - something you know is there but can't really say how. 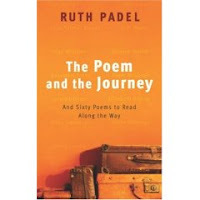 The musicality of poetry was just one of the themes that Ruth Padel discussed, she also discussed the genesis of poetry, the importance of metaphor, how some poetry is thought to be 'difficult' and how to interpret this as a reader. She said that 'difficult' poems are not a recent phenomenon but have existed for a long time and are good because they slow the reader down and make them think about what they were reading. Poetry, she said, is often generated by oppression and provides not just a window into the world but also a window into yourself (I much liked that idea). She also said it was important to see things in a different way. That, I guess, is true of all good writing - to see things differently, to see what some Russian theorists once called the 'fabulist'. In fact seeing things differently is important for all forms of creativity, not just poetry or writing. It is important in science, engineering and even government. Only by seeing things differently can we evolve and change. Interestingly she said that when she was collecting poems for this earlier collection written around 2001 the poets (all contemporary) had all sorts of different occupations but when she compiled her most recent work (The Poem and the Journey) they were all lecturers in creative writing course in colleges. She said that she thought this might change the sort of poetry being written in the UK and make it closer to the poetry of America. BAFAB Week: A Thrilling Thriller. For Buy-A-Friend-A-Book I would like to know the title of your favourite (intelligent) thriller and tell me why it thrilled you in less than 250 words. Just post your response in the comment box below leaving a contact blog address. 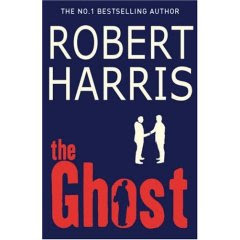 The prize will be the latest book by Robert Harris THE GHOST (published last Wednesday). The dead-line is Wednesday 31st October at midnight GMT. Judy Thomas at WELCOME TO MY WORLD is holding a draw. Karen at KAREN WRITES is holding a draw too. And Marianne Arkins at READING, WRITING AND STUFF THAT MAKES ME CRAZY is holding a draw for an ebook. Anne S at CAT POLITICS has a quiz...excellent idea. Dr Grump's Second Chocolate Experiment. 'Have some of this,' Dr Grump said, proffering a few squares of her favourite 98% cocoa solids organic chocolate in my direction. To be honest I was a little surprised. Dr Grump is notoriously mean with her chocolate; she buys it on special order from a specialist Columbian supplier on the internet. I chose the largest piece and slipped it into my mouth whole; I am a gobbler rather than a nibbler. I didn't chew. I just let the block melt on my tongue waiting for the rush of bitterness to follow the first taste of sugar. But it didn't come. Instead of the satisfying savoury smell and taste of cocoa the sweetness lingered greasily and queasily. 'What is this?' I asked her, grimacing and searching around for a tissue. I nodded my head. I was too busy spitting to properly reply. I looked at her. Dr Grump has changed recently, no doubt about it. She has lost some of her fire. 'What's wrong?' I asked her yet again, but she just shook her head and said nothing.